WORST OF ALL EVILS, the debut thriller by Janet McClintock, explores honor and trust and the blurry line between being good or bad. I had the absolute pleasure of interviewing Ms. McClintock, who has raced motorcycles, owned horses, drove a tractor trailer across the country, and has spent thirty years training in martial arts. Action comes easy to her. Tell me, what’s the premise? Joan Bowman joins the Constitution Defense Legion to fight a runaway government in Washington, D.C., but after working her way into a leadership position, she discovers the underground resistance group is as bad as the government it is fighting. Her only way out alive is to become a state’s witness, but betraying the group means betraying her mentor and lover. Two things: first, the question arose whether the oath I took when I enlisted in the Army was for the term of enlistment or forever. When I determined it was forever, I wondered what I would do if an administration in DC nullified the Constitution, and I was obligated to fulfill my oath. The story of Joan Bowman was born. I migrate around my house. My laptop resides in my office, and I’ve been known to write there, but I spend a lot of time at the dining room table and a cushy chair in the living room. When the weather cooperates, I’ll spend some time writing on the deck. Although I knew the editors and designers are overwhelmed with work, I thought they would have systems in place to handle it. I was surprised to learn that I had to keep track of each step along the way so the forward momentum of the process didn’t grind to a halt. I have a 3×5 card tacked to the bulletin board above my desk which says: “It’s the story, stupid.” It’s my constant reminder to myself to squelch the urge to edit as I go. So aspiring writers, when you sit down to write your story…write. Get the story onto the pages. Don’t fret over commas or grammar or sentence structure. You can manipulate the plot points and insert foreshadowing later. It’s all about the story. In order to write something you have to, well, write it. Polish out the warts and wrinkles after your first draft is complete. I’m not sure what you mean by collaborative, but I know for a fact, my first book would have never been published if I hadn’t submitted the second book in the series to my critique group. As they helped me develop my craft and style, I would return to Worst of All Evils to re-edit it. Also, I have found that writers are unique in that we support each other and are genuinely happy when fellow writers succeed. Anywhere. Everywhere. For instance, the idea for The Legend of Dan, my supernatural story, came from a quote on an inspiration calendar. I have a psychic thriller gelling in my head, and that idea came from something I saw on a documentary. I would have sought out a critique group sooner. I honestly feel the writer I am today, and will be in the future, is the direct result of their loving criticism and guidance. Tell us something about you that readers may be surprised to know. In spite of my hard-hitting thrillers and my continued marital arts training, for recreational reading I love romance novels. I especially like Darynda Jones and the more recent novels of Elizabeth Lowell. You may pick up a print book or e-book on Amazon here or Barnes & Noble. I’m in the process of polishing Hottest Places In Hell (Iron Angel Series Book #2) for submission. It is the continuing story of Joan Bowman, who is now a fugitive from justice. She is dealing with PTSD and forgiveness issues while fighting off La Espada, a paramilitary group that is determined to reclaim the southwest US for Mexico. The leader of this group has a personal vendetta against Joan, so it’s a personal fight for survival as well as for the greater good of the US. Where can we find your author website? After twenty-two years in the US Army, Ms. McClintock settled in Pittsburgh. She has trained in martial arts, is an avid equestrian, and once dove headlong in love with biker culture. 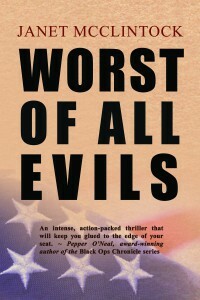 WORST OF ALL EVILS is the first book in her four-part IRON ANGEL thriller/action series. I just finished reading Worst of All Evils and all I can say is Ms. McClintock better hurry up and publish the next one! A thriller that epitomizes the genre!